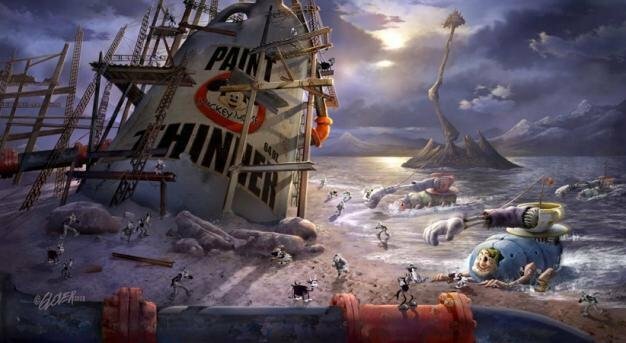 The reactions of many to the initial screenshots of Epic Mickey were mixed at best, no doubt in part due to the fact that it was radically different in style from the stunning concept art that was leaked months before. While the concept art portrayed an edgy, almost steampunk portrayal of classic Disney characters and locations and had washed-out colors, the screenshots thus far released show a brighter, more colorful, and overall “safer” interpretation. In a recent interview creator Warren Spector explained this disparity. While he still intends to push the envelope with Mickey and the supporting cast in Epic Mickey, the early concept art evidently pushed the envelope too far and got a big fat veto from the higher ups at Disney. However, he added that gamers should fear not because some elements in those pieces are still in the game like the robot version of Donald Duck, but he didn’t provide specifics.